DJ Dave Productions provides one of the most exciting sound & light shows available anywhere in Houston area! 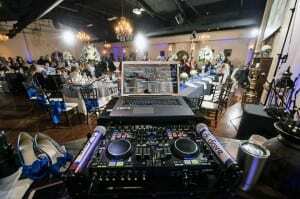 Don’t be fooled by the fly-by-night DJ companies with inferior lighting and sound equipment. 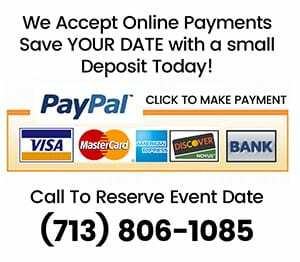 Rest assured, we only use true professional grade audio sound & light gear by the top names in the commercial sound and lighting industry like JBL and QSC K-Series Equipment, Denon, American DJ, Chauvet, Eternal Lighting, Virtual DJ Pro, Traktor Pro, HP, Lenovo, and Others! This may not mean much to most people, but if you reading this page it means a lot. We are heads and tails above our competitions in regards to sound quality, music knowledge, and basic sound technology, we know how to make the music sound amazing, like it was orginally recorded. If you appreciate a true professional you have come to the right company to rely on. Many of our competitor DJ companies which play CDs they ripped on their PCs from pirated music sharing sources, we follow Anti-Piracy and Copyright Laws for the music, video and karaoke songs we offer. We have thousands of song titles and proudly subscribe to Top Hits music service, (available only to professional mobile entertainers and radio stations), for the latest releases, many times before they are even in retail stores! We receive all of the latest and most current songs monthly. 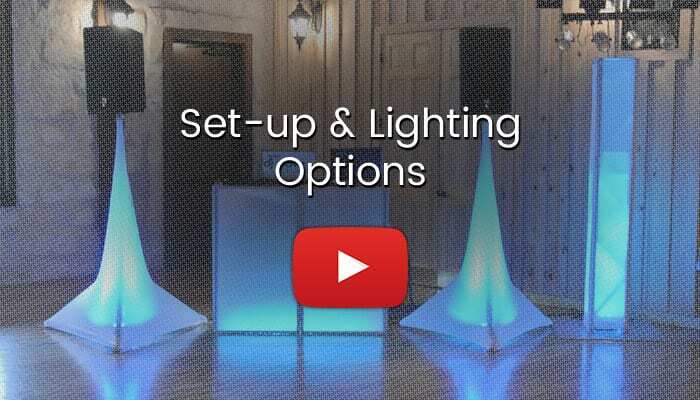 Secondly we have a full arsenal of lighting effects that will just wow you and your guests. From dance floor washes, strobe lights, to moon flower lighting, LED up-lighting, Scanners, customized monogrammed “GOBO’s”, to a Star-Field Nebula displayed on ceiling, wall, or floor; DJ Dave Productions has all of the latest and hottest lighting effects. We are always upgrading our gear to the most current lighting trends and offerings. You will be impressed as well as your guests with our lighting options. 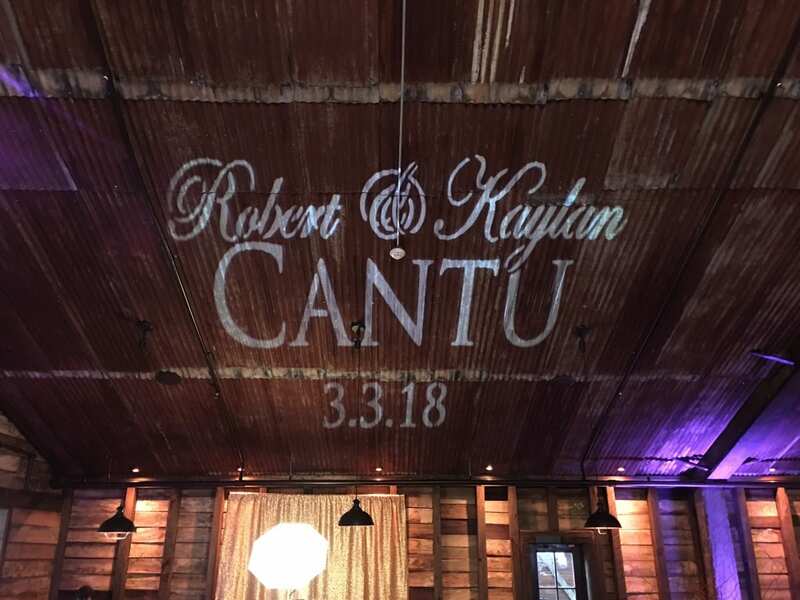 We also have included some additional pictures showing additional options of big projections screens and custom GOBO on a dance floor. 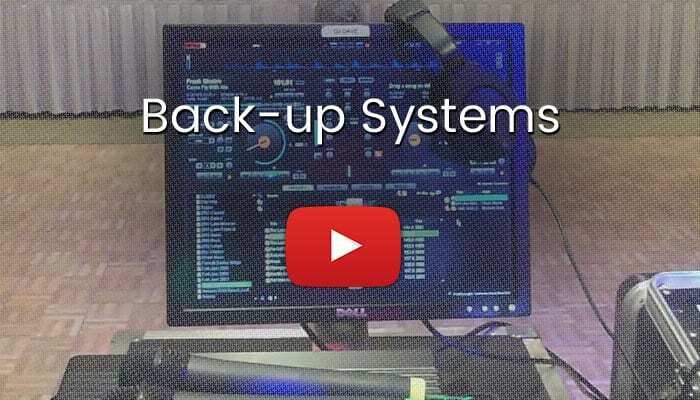 There are several videos below, Below is a video that show many variations of our DJ Dave Production different set-ups and available options. 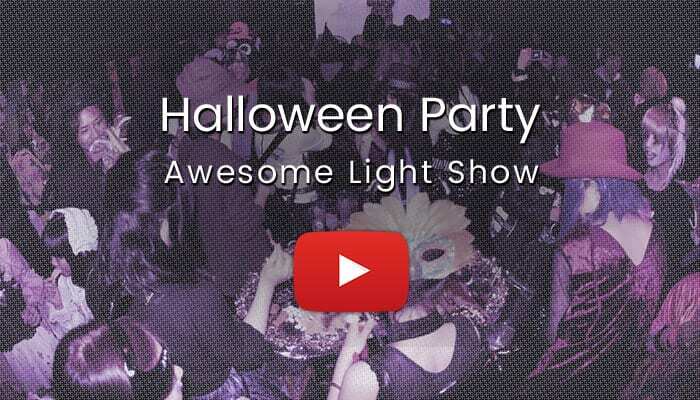 back-up DJ equipment and the other showing some footage from a Halloween party light show.